The collapsible core is typically used for applications with plastic parts requiring internal threads, undercuts, protrusions or cut-outs. Expandable cores completely eliminate the need for side-action mechanisms and additional steps for machining. 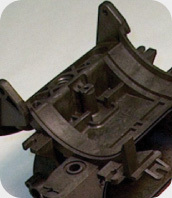 The end result is intelligent engineering, reducing the size and cost of tooling, ultimately yielding a superior part.